Oil drums, paint cans and twisted wire form the basis of this drum kit. 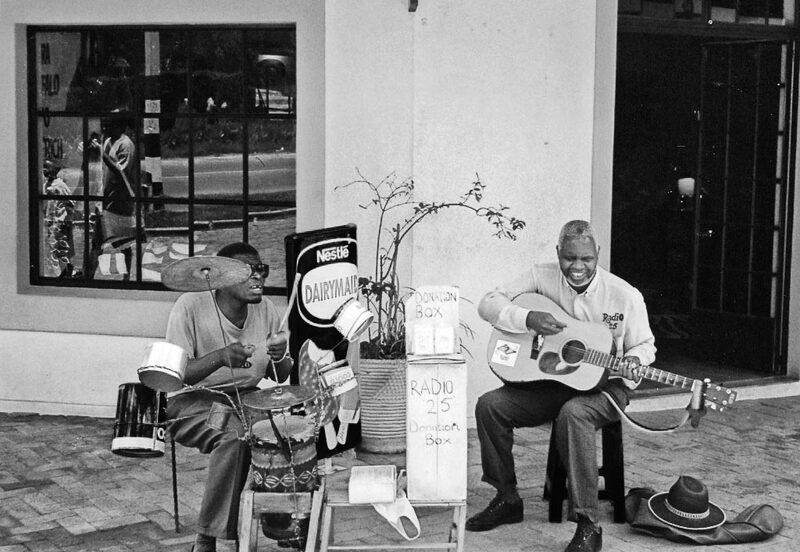 A happy duo busking on the streets of Victoria Falls, December, 2000. Please visit Paula to see other representations of this week’s challenge. I arrive at the Zimbabwean side of the falls, which appears to have been untouched for the last 25 years. There is no commercialism here. Apart from a distant hum and some fine wisps of mist drifting upwards you would never know that you were so close to one of the Wonders of the World. There is a wooden kiosk where I buy my entrance ticket and nothing else, no map, no information guide and no refreshments other than a local hawker selling the usual selection of cans of cold drinks opposite the park’s entrance. A relentless sun burns down. As I battle my way through the untamed foliage the noise is both exhilarating and deafening; any conversation is impossible. Suddenly the falls come into view. Such a spectacular sight it literally takes my breath away. I get wet, I get dry and I get wet again. 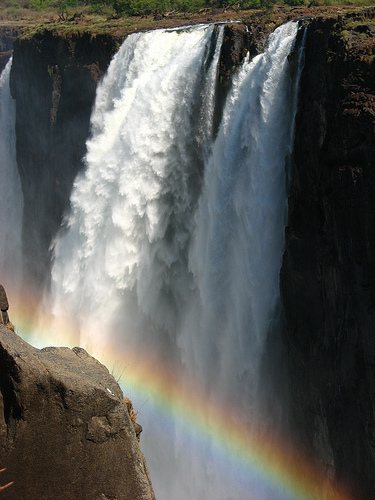 I stand as close to the edge as I dare, overlooking the mighty curtain of water from the Zambezi River cascading over the basalt rock cliffs, the columns of ‘smoke’ rising, and a myriad of rainbows forming. Such power. Nature at her most magnificent. My heart lifts. I have a broad grin on my face. This is why I travel. ‘Hakuna Matata’ my friends. All is well.